This is a card I made for Father’s Day. There are many golfers in my family so I am not sure who will be the recipient. 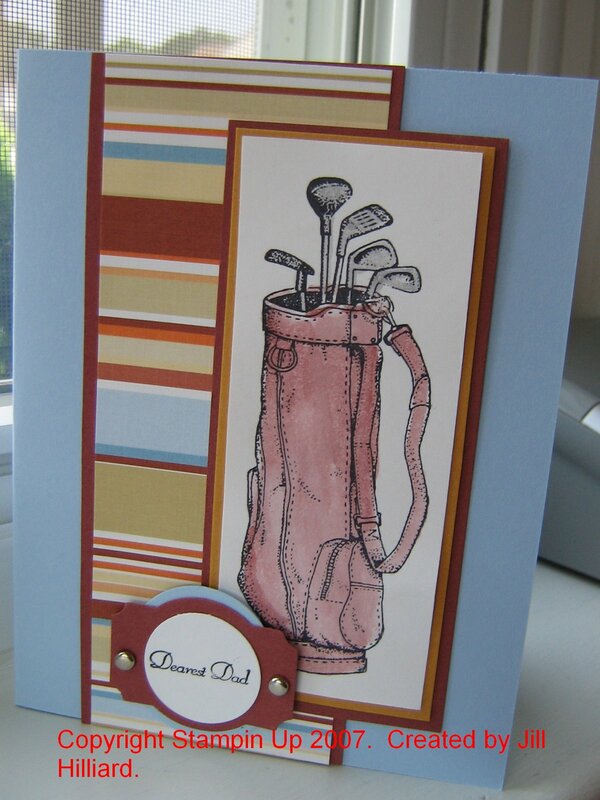 The golf bag is colored with cranberry crisp ink and the water brush. The label is popped up on dimensionals. Enjoy! Stamps: Stampin’ Up: Fancy Flexible Phrases and Fore! Paper: bashful blue, cranberry crisp, more mustard, whisper white card stock. Chatterbox designer paper. Other: Designer label punch, various circle punches, silver brads. I love every thing about this card! The colors, the DP….every thing! Super card!